Set in the heart of Downtown San Antonio TX Hampton Inn - Suites San Antonio-Downtown/Market Square TX is a newly renovated historic building just minutes from Market Square. The Alamo the Henry B. Gonzalez Convention Center and the San Antonio River Walk are only blocks from our Downtown San Antonio hotel. Guests can enjoy easy access to many major businesses and military bases. In addition popular attractions such as the Six Flags Fiesta Texas theme park and SeaWorld are just a short drive from our welcoming hotel in downtown San Antonio TX. Feel at home in a comfortable guest room or suite and enjoy modern amenities including a microwave and a refrigerator. 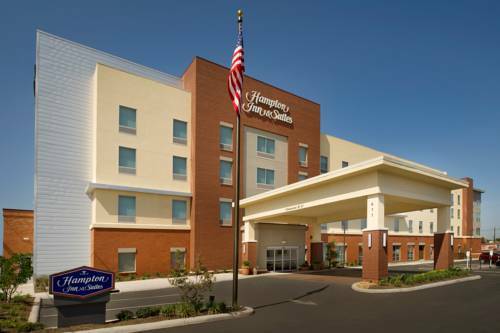 Stay connected with free WiFi at the large desk watch movies on the LCD TV and sleep soundly on the clean and fresh Hampton bed. Join us each morning at this San Antonio hotel near the River Walk for Hampton*s free hot breakfast buffet offering everything from hot items to light continental favorites. Enjoy free tea and coffee in the lobby 24-hours a day and ask our friendly staff about things to do in downtown San Antonio TX. Our 24-hour Suite Shop offers a variety of snacks and sundries. Work out with modern exercise equipment in our free fitness center or refresh in the heated indoor swimming pool. Friendly service clean rooms comfortable surroundings every time. If you*re not satisfied we don*t expect you to pay. That*s our commitment and your guarantee. That*s 100 Hampton. All reservations must be cancelled by 6PM host time unless deposit is required. If this reservation has been made electronically please cancel it electronically to avoid confusion and a no show bill. Policy is subject to change.